Thursday April 21st 1881 It was raining so I could not go over to Hatts and I made May a dress out of an old one of mine I found in the garret. 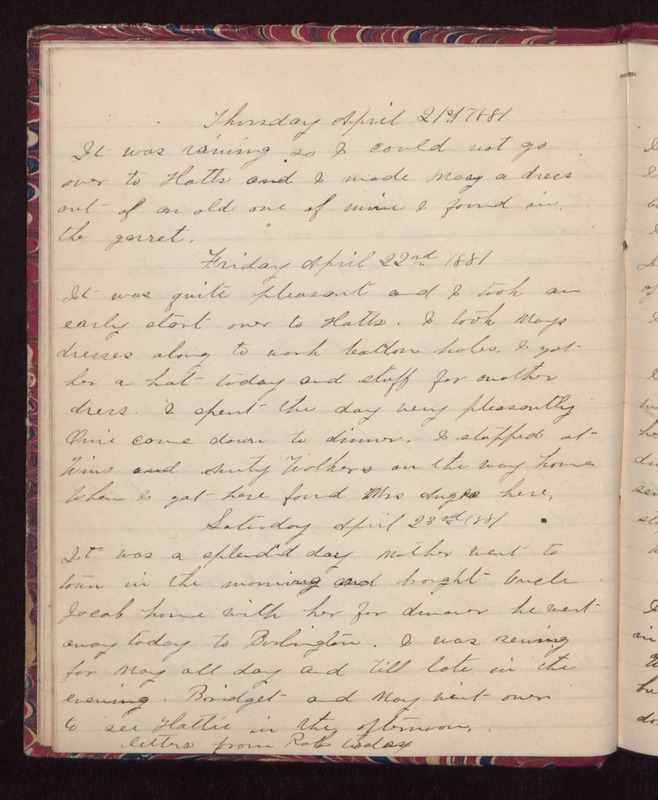 Friday April 22nd 1881 It was quite pleasant and I took an early start over to Hatts. I took Mays dresses along to work button holes. I got her a hat today and stuff for another dress. I spent the day very pleasantly. Orrie came down to dinner. I stopped at Wins and Aunt Walkers on the way home. When I got here found Mrs Angier here. Saturday April 23rd 1881 It was a splendid day. Mother went to town in the morning and brought Uncle Jacob home with her for dinner. He went away today to Burlington. I was sewing for May all day and till late in the evening. Bridget and May went over to see Hattie in the afternoon. Letters from Rob today.